Innovative tool illustrates the revenue expansion opportunities for hotels in the group market and simple ways to leverage them. It’s a fun and effective way to convey to hotels the many ways they can lift their group RevPAR, ADR and revenue. With industry research showing that 13% of travelers will upgrade their room and 64% will consider ancillary services, that’s meaningful. Passkey, developer of the hotel industry’s leading group reservation technology, today introduced its innovative “Rev-up” infographic, illustrating with striking graphics the enormous opportunities hotels have to boost their group RevPAR and revenue by applying a wide range of methods and strategies. Groups are a key component of most hotels’ business, accounting for over 30% of total hotel revenue or about $100 billion annually. 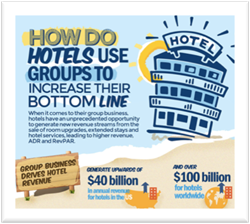 The Rev-up infographic illustrates the countless opportunities hotels have to generate revenue, RevPAR and profit gains by intelligently leveraging modern booking and marketing tools to drive reservations online, and merchandise room upgrades, extended stays and add-ons to their group guests. The Rev-up infographic further outlines that the potential increases in revenue from up-sells could be as high as 23% during the booking experience, which would be a measurable uptick. The infographic is available at http://www.passkey.com/campaign/group_revenue_infographic/. Passkey (http://www.passkey.com) is the travel industry's leading hotel booking technology for meetings and events. The Company's cloud-based platform, GroupMAX, is used by thousands of hotels, destinations and meeting planners worldwide to manage the hotel accommodation process for events of every size. At the heart of GroupMAX is the ability for group guests to book their hotel rooms online in event-specific booking websites while enjoying multiple stay and upgrade options. With offices in the US, UK, Hong Kong and Singapore, the Passkey global network now includes over 90% of major US and UK Convention and Visitors Bureaus, as well as a wide range of hotels, casinos, resorts, meeting planners, corporations and meeting management companies.